When the Toronto Maple Leafs’ lineup is healthy, van Riemsdyk skates on the third line with Tyler Bozak and either Kasperi Kapanen or Connor Brown. Though he is receiving low 5-on-5 minutes, it does have its advantages for van Riemsdyk as he battles against checking lines and weaker players on a regular basis, immediately increasing his DFS value. Leafs head coach Mike Babcock has kept the gritty Zach Hyman manning the left wing on the top line in almost every game this season due to his bulldog mentality and ability to create space for Auston Matthews and fellow line mate William Nylander. 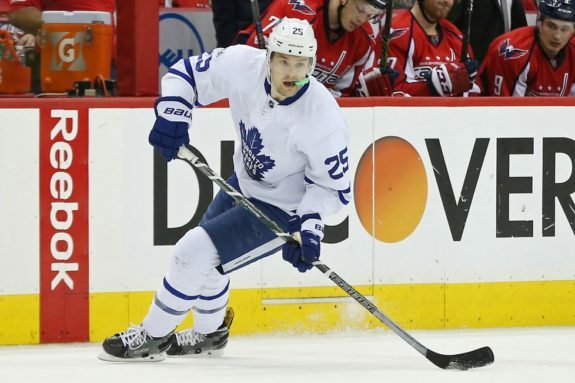 However, Hyman has registered just 34 points in 59 games while van Riemsdyk’s 26 goals are tied for second on the team with Nazem Kadri and van Riemsdyk plays a vital role in front of the net on the team’s second power play unit. The limited role has resulted in a deflated DFS price tag, but the role hasn’t affected van Riemsdyk’s natural goal-scoring ability. With sophomore sensation Matthews currently out of the lineup, someone has to replace his goals and van Riemsdyk fits the bill. The Leafs have received production from everywhere in the lineup this season which bodes well for the veteran’s fantasy prospects as he gears up for a third playoff run. The Florida Panthers have been on an absolute tear of late, picking up 17 of a possible 20 points over the last 10 games, sitting just two points out of the final wild-card berth with two games in hand. Midway through the season, Panthers head coach Bob Boughner wasn’t getting any chemistry from his top-six forwards and needed to kickstart his lifeless offense before it was too late. The most notable move was to slide Bjugstad from the third line center role to right wing on the first line. 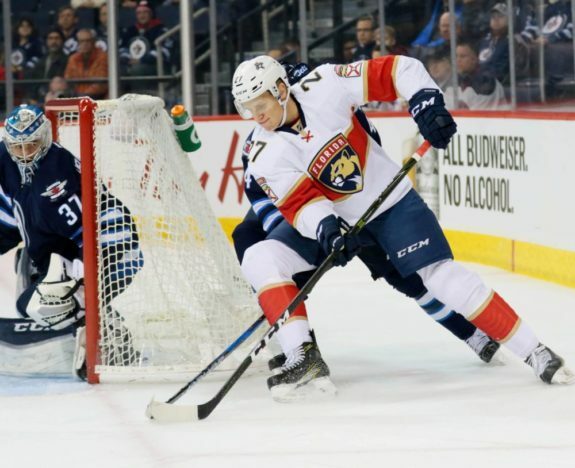 The scoring line of Evgeny Dadonov, Aleksander Barkov and Nick Bjugstad has carried the team since being formed and the trio will look to remain hot over the final 12 contests. The combination of Dadonov’s skill, Barkov’s intelligence and Bjugstad’s size makes for a dominating line. At 6’6″, 218 lbs, Bjugstad’s terrifying to try and defend against when he’s carrying the puck down the right wing at full speed. The Panthers love Bjugstad’s size but he just hasn’t been able to stay healthy to start his career. The 25-year-old Minnesota native has yet to play a full 82-game season and was fresh off a porous 2016-17 campaign when he only racked up 14 points in 54 games. However, this year is different. He has played in every game thus far, racking up 40 points and is poised to surpass his previous career-high point total of 43. While the DFS price tag of Dadonov and Barkov will empty DFS bettors’ wallets, Bjugstad’s DFS cost remains relatively low for his recent production. His ceiling for the remainder of the season will remain high and should be rolled in at least one of your DFS lineups as the Panthers continue to push for that final playoff spot. Aberg came through in the clutch for the Nashville Predators during the magical playoff run, notching one goal and two assists in Game 6 and Game 7 of the Western Conference Finals against the Anaheim Ducks. However, the Predators sent the 24-year-old speedster to the lowly Edmonton Oilers in exchange for Mark Letestu. Now with the Oilers, he is skating on a line with McDavid and Ryan Nugent-Hopkins, which could result in a high DFS ownership moving forward. 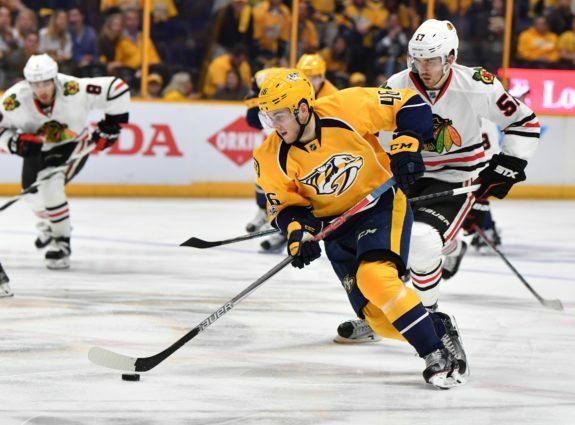 He possesses blazing speed down the wing and proved he could score goals in the AHL, totalling 76 in four stints with the Predators affiliate, the Milwaukee Admirals. The Oilers’ offense could take off down the stretch by adding young talent and speed alongside McDavid and if Aberg begins to stuff the statsheet over the next couple of games, he will be a must-start in cash games with an already low DFS cost. Spooner has been loading up points since being acquired by the New York Rangers on Feb. 25. As he’s auditioning for a top-six forward role with the Rangers next season, expect his hot-streak to continue. Since coming over from the Boston Bruins in exchange for Rick Nash, Spooner has registered four multi-point games, one less that the five he recorded with the Bruins this season. His 11 points in seven games make him an appealing contrarian play whenever he steps onto the ice. The Rangers are starving for offense. One of the team’s most reliable point producers the past two seasons, Mats Zuccarello, has 14 goals and 34 assists for 48 points and has struggled to find the point sheet on a consistent basis. He still leads the team in points and is developing chemistry with Spooner, scoring four goals and another assist in his last four outings. It’s unclear whether Spooner and Zuccarello will be playing together in New York next season, but for now a lot of DFS bettors will elect to fade the tanking Rangers and their players. At a low price point and extremely high upside, both players are worth rolling in cash games and GPPs. Columbus Blue Jackets center Alexander Wennberg has had an extremely disappointing season after exploding for 13 goals and a team-high 46 assists last season. The 23-year-old battled a back problem this season which has hindered his production to a measly 31 points in 55 games. Dubois, on the other hand, has enjoyed a stellar rookie season and sits third among Blue Jackets skaters in points with 37. 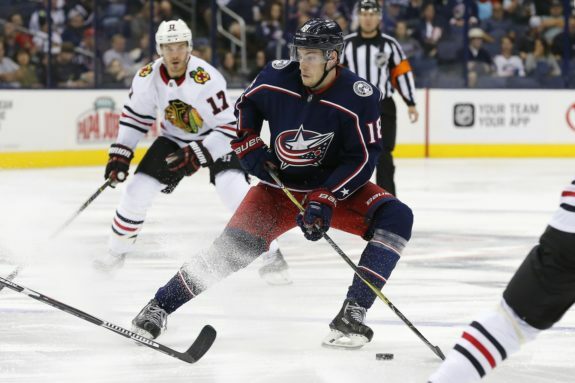 He has become the team’s first line center and it looks as though the 19-year-old will be an integral piece to the Blue Jackets as they continue to battle for a wild-card spot. Over his last 15 games, Dubois has averaged 17:51 minutes of ice time while potting three goals and adding nine assists. He’s developing chemistry with the scorching hot Artemi Panarin and last year’s 35 goal-scorer Cam Atkinson. The Blue Jackets lack scoring talent up front and with Dubois’ extremely high fantasy ceiling and middling DFS price point, he’s a terrific play with the Blue Jackets playing four of their last 12 games against teams near the bottom of the league in goals against average (GAA).